Salicylic acid is an important organic synthetic raw material, widely used in medicine, pesticides, dyes, rubber, food and perfumes. In the pharmaceutical industry, the main drug productions of salicylic acid are sodium salicylate, wintergreen oil (methyl salicylate), aspirin (acetylsalicylic acid), salicylic acid amine, phenyl salicylate. In dye industry, it is used for production mordant pure yellow , direct yellow 3GN, direct yellow GR, direct brown 3GN, acid mordant brown G, acid mordant yellow GG, acid yellow dye complex. In pesticide production, salicylic acid is used for the synthesis of organic phosphorus pesticide Isocarbophos, intermediate isopropyl salicylate isofenphos methyl and Rodenticide warfarin, coumatetralyl intermediate 4-hydroxycoumarin. In rubber industry, it is used as anti scorching agent and production of ultraviolet absorbent and foaming agent. It is perfume material, used for the preparation of methyl salicylate, salicylic acid ethyl ester; food preservatives, its sodium Salt is mostly used, now a number of countries have been banned; methyl salicylate can be used as oral cleaning agents, such as toothpaste flavor. Salicylic acid has sterilization ability, 2.5% alcohol solution (called spiritus) is used as a topical medicine in the treatment of tinea manus and tinea pedis, also can be made into ointment. Sodium salicylate can be used for food preservative or preservatives, also can be used for the preparation of toothpaste, mouthwash. Salicylic acid has antipyretic and analgesic effects, can cure rheumatism and so on. It's all esters can be used as drug and spices. Methyl salicylate has pleasant aromas of holly, is used for the preparation of perfume and soap flavor. The methyl salicylate is coated on the skin, can penetrate into the muscle and let out of salicylic acid to release local pain, so it also can be used for the treatment of pain, contusion, sprain and other medication. Isoamyl salicylate has orchid aroma, benzyl salicylate has weak ester aroma, both can prepare perfume or soap flavor. The common name of phenyl salicylate is Salo, was hydrolyzed into phenol and salicylic acid in the intestine , is a kind of effective enteral preservatives. Another Kind drug related to salicylic acid is para aminosalicylic acid (PAS, see "Para amino salicylic acid), Its sodium and calcium salts are used as anti TB drugs for acute exudative pulmonary tuberculosis (TB) and mucosal tuberculosis, is a weak antimicrobial drug, the effect is only 2% of streptomycin, often combined with streptomycin and isoniazid , in order to enhance the curative effect. It can be acetylated to the aspirin. 1.white needle crystal or crystalline monoclinic edge, spicy. Slightly soluble in water, soluble in acetone, turpentine oil, ethanol, ethyl ether, benzene and chloroform. 2.The acidity of salicylic acid is stronger than benzoic acid, it becomes darker in color in the sun. In the case of iron ion, it becomes into purple chelate. It reacts with ferric chloride to show purple, is unstable to heat, easy to decarboxylation to produce phenol heating to 200 ℃. In Nature salicylic acid mostly is in the form of methyl existing in birch bark oil, content is up to 96%. There are existing in cinnamon oil, violet oil, wintergreen oil. Free salicylic acid only a few exist in plants. Salicylic acid has double property of phenol and carboxylic acid. When heated, it is sublimation, and rapid heated, it decomposites to phenol and carbon dioxide. When react with sodium hydroxide , hydroxyl and carboxyl groups were neutralized to produce the double salt; but with sodium carbonate, only the carboxyl groups are neutralized and build a single salt. When reacts with alcohol or phenol, it can generate the corresponding carboxylic acid ester. This product is toxic and irritating to the skin, mucous membrane, and reaction with the body tissue protein, so it is corrosive, from another aspect, it can be sterilized. Rats LD501100～1600mg/kg. Storage is stable but powder and air mixed to produce explosion. In Industry, salicylic acid was prepared by sodium phenolate and carbon dioxide in the heating pressure reaction system (Kolbe Schmitt reaction), the first generated to sodium salt of phenol by neutralized sodium hydroxide with phenol, and in 4~7 x 105 Pa (4~7 ATM) and 125℃, then absorb carbon dioxide to generate benzene sulfonic acid ester, by rearrangement to generate sodium salicylate, and acidification to salicylic acid. It is white crystalline powder, odorless, first bitter taste then sweet. Exists in the nature of willow bark, the leaves and sweet birch. The chemical formula of C6H4 (OH) (COOH), the melting point is 157-159 ℃. In the light, it gradually discolorated. The relative density is 1.44. The boiling point is about 211℃/2.67kPa. Sublimation at 76℃. Under the common pressure, it rapid thermal decomposited to phenol and carbon dioxide. Soluble in ethanol, ethyl ether, chloroform, benzene, acetone, turpentine oil, insoluble in water. 1g salicylic acid was dissolved in 460ml water, 15ml boil water, 2.7ml ethanol, 3ml acetone, 3ml ether, 42ml chloroform, 135ml benzene, 52ml glycerol turpentine, about 60ml glycerol and 80ml petroleum ether. Adding sodium phosphate, borax can increase the solubility of salicylic acid in water. PH of Salicylic acid aqueous solution is 2.4. Alicylic acid reacts with ferric chloride aqueous solution to generat special purple. Salicylic acid—a beta hydroxy acid that also sloughs dead cell buildup within the follicle, acts as a mild antibacterial, and has soothing properties. Salicylic acid is regarded to be less irritating than benzoyl peroxide and has less allergy potential, but it is also less aggressive in treating acne. It is often used for treating milder forms of acne. The concentration in OTC drugs is limited to 2 percent. Salicylic acid is also used as a performance ingredient exfoliant in smaller concentrations, without making a drug claim. Salicylic acid is widely used, eczema, psoriasis, salicylic acid can be used in acne, dandruff. The concentration of 3%~6% can be used to horny, higher than 6% of salicylic acid can damage to tissue . Below 40% of concentration is suitable for the treatment of thick cocoon, corns and warts. Salicylic acid can also be added in the treatment of acne and dandruff. Nowadays many famous cosmetic ingredients: in 1993, Clinique CLINIQUE first launched 1% salicylic acid in soft water cream, immediately became one of Clinique's most successful products; In 1998, SK-II crystal induced skin cream added 1.5%BHA ingredients to the original, and salicylic acid has effect of treatment pores and cutin like the egg peeling analogy that caused the market boom; open access Olay popular products activating cream also contains 1.5% BHA components. However, due to the high concentration of salicylic acid, it has a certain degree of damage, cosmetics containing salicylic acid concentration has generally been limited between 0.2%~1.5%, containing salicylic acid cosmetics shall be added to the note of warning signs to determine the safety of long-term use and children under 3 years of age also shall not be used. Salicylic acid (BHA) is extracted from willow bark , holly leaf, also called plant acid; Tartaric acid (AHA) was extracted from sugarcane; two different raw materials extract acid. The two can control the oil, cutin, remove acne, shrink pores, light print. More than 50% concentration of the acid change skin can be operated by only the doctor of Department of Dermatology, and no matter how much concentration of salicylic acid, skins are classified as medical treatment, it is worth noting that a few people are not suitable for the use of any concentration of salicylic acid, so the general beauty salon is not executed, below 40% of salicylic acid in the acid skin beauty salon is allowed in law, in contrast, Tartaric acid is safer than salicylic acid. As for the effect of salicylic acid, salicylic acid only locked in the superficial stratum corneum, just play a simple treatment and blocking effect, changing the skin is only temporary, while the tartaric acid into the true cortex changed fundamentally. The skin can be cured, the dermal damage formation pox pits, salicylic acid becomes incapable of action, so it can not be called salicylic acid skin, can only be called salicylic acid treatment. The safety of salicylic acid and tartaric acid and skin effect are different, because tartaric acid is not toxic, use from low to high (8%-15%-20%-30%-40%), slowly adaption is not burn the skin, disfigured and any side effects. While salicylic acid is toxic, high concentration is not suitable for use in the face, there are certain restrictions on the concentration, the concentration can be used to the skin in the 3%-6%, higher than 6% salicylic acid is corrosive to the skin, a high concentration of 40% salicylic acid has strong corrosion properties of keratin. 1.Salicylic acid namely ortho hydroxy benzoic acid (o-hydroxybenzoic acid) is a kind of important organic synthetic raw material. In pesticide production, it is used for synthetic organic phosphorus pesticide Isocarbophos, isofenphos methyl intermediates isopropyl salicylate and Rodenticide warfarin, kill rats ether intermediate 4-hydroxy coumarin; in the pharmaceutical industry, salicylic acid was used as antiseptics, also as intermediates of acetylsalicylic acid (aspirin) and other drugs; it is also an important raw material of dye, spices, such as rubber industry . 6.Salicylic acid is an important raw material of medicine, spices, dyes, rubber auxiliaries and other fine chemicals. In the pharmaceutical industry, salicylic acid itself is used as antiseptics, for local cutin hyperplasia and skin fungal infection. As for pharmaceutical intermediates, it is used for production of ethenzamide, diuretin, acetylsalicylic acid (aspirin), sodium salicylate and salicylamide, glibenclamide niclosamide, salicylic acid, phenyl ester, ethyl p-hydroxybenzoate, bismuth subsalicylate, sulfasalazine and other drugs. In the dye industry, it is used for the production of direct yellow GR, direct grey BL, direct light brown RT, acid mordant brown G, acid mordant yellow GG dye. Salicylic acid esters are used as spice, for example, methyl salicylate can be used as toothpaste and other oral spices and other spices and food spices. Used in rubber industry production antiscorching agent, ultraviolet absorbent and foaming agent and water. Salicylic acid can also be used as a phenolic resin curing agent, textile printing and dyeing pulp preservatives, synthetic fiber dyeing of the expansion agent (agent) and so on. 1. The phenol and sodium hydroxide react to produce phenol sodium, distillation and dehydration, CO2 carboxylation reaction to obtain sodium salicylate, then using sulfuric acid and produce crude product. The crude product through the sublimation refined to the finished product. Raw materials consumption quota: phenol (98%) 704kg/t, alkali burn (95%) 417kg/t, sulfate (95%) 500kg/t, carbon dioxide (99%) 467kg/t. 2.The preparation method of the method is that the sodium salt of phenol and carbon dioxide can be obtained by acidification. phenol and liquid caustic soda are produced into solution of the sodium salt of phenol, vacuum drying, and then to 100℃, slowly put to the dry carbon dioxide, when the pressure reaches 0.7~0.8MPa, stop passing carbon dioxide, warming up to 140 to 180℃. After the reaction with water, sodium salicylate dissolved and decolorization, filtering, coupled with the sulfuric acid, namely precipitation salicylic acid, after filtering, washing and drying to obtain the product. Also known as o-hydroxybenzoic acid,C6H4(OH)(COOH) is a white powder with an acrid taste that is stable in air but gradually discolored by light. Soluble in acetone, oil of turpentine, alcohol, ether,benzene; slightly soluble in water,and combustible. Derived by reacting a hot solution of sodium phenolate with carbon dioxide and acidifying the sodium salt thus formed. Used in the manufacture of aspirin and salicylates, resins, dyestuff intermediate, prevulcanization inhibitor, analytical reagent,and fungicide. Salicylic acid is a white to tan crystalline solid; needles. salicylic acid is a beta-hydroxy acid with keratolytic and antiinflammatory activity. It helps dissolve the top layer of stratum corneum cells, improving the look and feel of the skin. Salicylic acid is an effective ingredient in acne products and as such is widely used in acne soaps and lotions. Because it is lipid soluble, it can more easily reduce sebaceous follicle blockage by penetrating the pores and exfoliating the cellular buildup. It is antimicrobial, anti-septic, enhances the activity of preservatives, and can be used to adjust the pH of products. For the treatment of aging skin, it appears to help improve skin wrinkles, roughness, and tone. In addition, it is a useful ingredient for products formulated to treat psoriasis, callouses, corns, and warts-cases where there is a buildup of dead skin cells. When applied topically, it is reported to penetrate 3 to 4 mm into the epidermis. A small amount of salicylic acid can convert to copper salicylate, a powerful anti-inflammatory. used at high concentrations, salicylic acid may cause skin redness and rashes. This is a naturally occurring organic acid, related to aspirin. It is found in some plants, particularly the leaves of wintergreen, willow bark, and the bark of sweet birch. Salicylic acid is also synthetically manufactured. Salicylic Acid is an Impurity of Acetylsalicylic Acid (A187780). Acetylsalicylic acid Impurity B.
ChEBI: A monohydroxybenzoic acid that is benzoic acid with a hydroxy group at the ortho position. It is obtained from the bark of the white willow and wintergreen leaves. A crystalline aromatic carboxylic acid. It is used in medicines, as an antiseptic, and in the manufacture of azo dyes. Its ethanoyl (acetyl) ester is aspirin. See aspirin; methyl salicylate. Advanced Pain Relief Callus Removers (Schering-Plough HealthCare); Advanced Pain Relief Corn Removers (Schering-Plough HealthCare); Clear Away Wart Remover (Schering-Plough HealthCare); Compound W (Whitehall-Robins); Dr. Scholl’s Callus Removers (Schering-Plough HealthCare); Dr. Scholl’s Corn Removers (Schering-Plough HealthCare); Dr. Scholl’s Wart Remover Kit (Schering-Plough HealthCare); Duofilm Wart Remover (Schering-Plough HealthCare); Duoplant (Stiefel); Freezone (Whitehall-Robins); Ionil (Galderma); Ionil-Plus (Galderma); Salicylic Acid Soap (Stiefel); Saligel (Stiefel); Stri-Dex (Sterling Health U.S.A.). Odorless white to light tan solid. Sinks and mixes slowly with water. Sublimes and forms vapor or dust that may explode [USCG, 1999]. Salicylic acid is a carboxylic acid. Carboxylic acids donate hydrogen ions if a base is present to accept them. They react in this way with all bases, both organic (for example, the amines) and inorganic. Their reactions with bases, called "neutralizations", are accompanied by the evolution of substantial amounts of heat. Neutralization between an acid and a base produces water plus a salt. Carboxylic acids with six or fewer carbon atoms are freely or moderately soluble in water; those with more than six carbons are slightly soluble in water. Soluble carboxylic acid dissociate to an extent in water to yield hydrogen ions. The pH of solutions of carboxylic acids is therefore less than 7.0. Many insoluble carboxylic acids react rapidly with aqueous solutions containing a chemical base and dissolve as the neutralization generates a soluble salt. Carboxylic acids in aqueous solution and liquid or molten carboxylic acids can react with active metals to form gaseous hydrogen and a metal salt. Such reactions occur in principle for solid carboxylic acids as well, but are slow if the solid acid remains dry. Even "insoluble" carboxylic acids may absorb enough water from the air and dissolve sufficiently in Salicylic acid to corrode or dissolve iron, steel, and aluminum parts and containers. 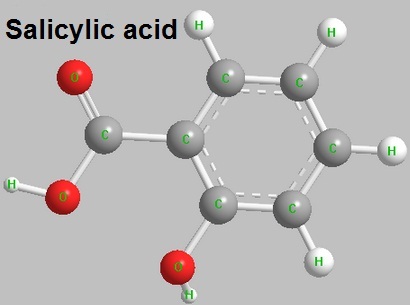 Carboxylic acids, like other acids, react with cyanide salts to generate gaseous hydrogen cyanide. The reaction is slower for dry, solid carboxylic acids. Insoluble carboxylic acids react with solutions of cyanides to cause the release of gaseous hydrogen cyanide. Flammable and/or toxic gases and heat are generated by the reaction of carboxylic acids with diazo compounds, dithiocarbamates, isocyanates, mercaptans, nitrides, and sulfides. Carboxylic acids, especially in aqueous solution, also react with sulfites, nitrites, thiosulfates (to give H2S and SO3), dithionites (SO2), to generate flammable and/or toxic gases and heat. Their reaction with carbonates and bicarbonates generates a harmless gas (carbon dioxide) but still heat. Like other organic compounds, carboxylic acids can be oxidized by strong oxidizing agents and reduced by strong reducing agents. These reactions generate heat. A wide variety of products is possible. Like other acids, carboxylic acids may initiate polymerization reactions; like other acids, they often catalyze (increase the rate of) chemical reactions. Respiratory alkalosis, hyperkalemia, hyperthermia, dehydration, convulsions, shock, res- piratory paralysis, respiratory acidosis, lesions and death from respiratory collapse; fetotoxic. Inhalation of dust irritates nose and throat. Vomiting may occur spontaneously if large amounts are swallowed. Contact with eyes causes irritation, marked pain, and corneal injury which should heal. Prolonged or repeated skin contact may cause marked irritation or even a mild burn. Poison by ingestion, intravenous, and intraperitoneal routes. Moderately toxic by subcutaneous route. An experimental teratogen. Human systemic effects by skin contact: ear tinnitus. Mutation data reported. A skin and severe eye irritant. Experimental reproductive effects. Incompatible with iron salts, spirit nitrous ether, lead acetate, iodine. Used in the manufacture of aspirin. When heated to decomposition it emits acrid smoke and irritating fumes. Used as a topical keratolytic agent; in manufacture of aspirin, salicylates, resins, as a dyestuff intermediate; prevulcanization inhibitor; analytical reagent; fungicide, antiseptic, and food preservative. If this chemical gets into the eyes, remove any contact lenses at once and irrigate immediately for at least 15 minutes, occasionally lifting upper and lower lids. Seek medical attention immediately. Skin contact: remove contaminated clothing and wash immediately with soap and water. Seek medical attention immediately. If this chemical has been inhaled, remove from exposure, begin rescue breathing (using universal precautions, including resuscita- tion mask) if breathing has stopped and CPR if heart action has stopped. Transfer promptly to a medical facility. When this chemical has been swallowed, get medical attention. Give large quantities of water and induce vomiting. Do not make an unconscious person vomit. iron salts; lead acetate; iodine. Forms an explosive mixture in air. 69-72-7 US $10.00 / Kg 1Kg 99% 5000kg/month Hebei Chisure Biotechnology Co., Ltd.
69-72-7 US $1.00 / KG 1KG High quality manufacturer TOP 3 largest production factory in China Chemwill Asia Co.,Ltd. SALICYLIC ACID EXTRA PURE, DAB, PH. EUR.